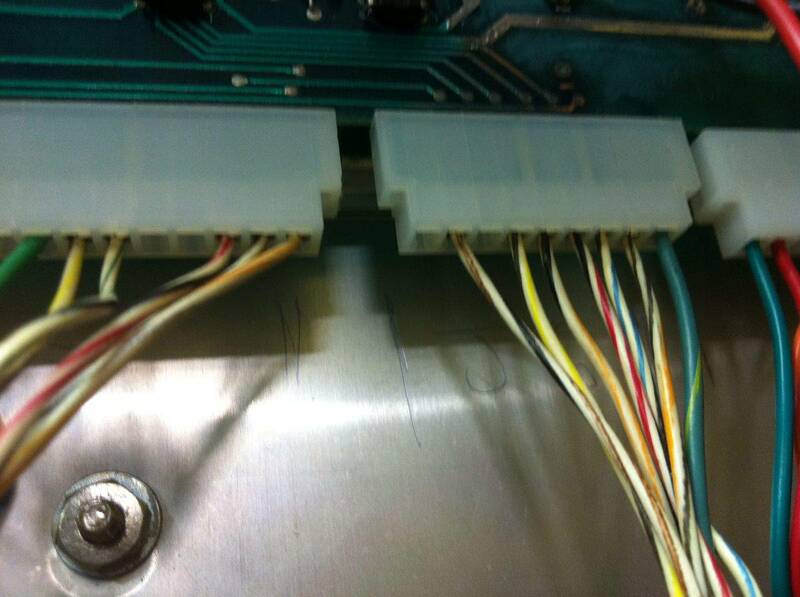 Wondering if anyone can post a closeup pic of the CPU connectors A1-J6 & A1-J7 from a Countdown machine? I recently re-pinned those two connectors & I'm certain I have it wired wrong. Here's the pinout for A1-J6 & A1-J7 from Joker Poker. I would imagine it's standard across System 1 games. Thanks for the pinout. Seems the wire coloring is different on countdown? 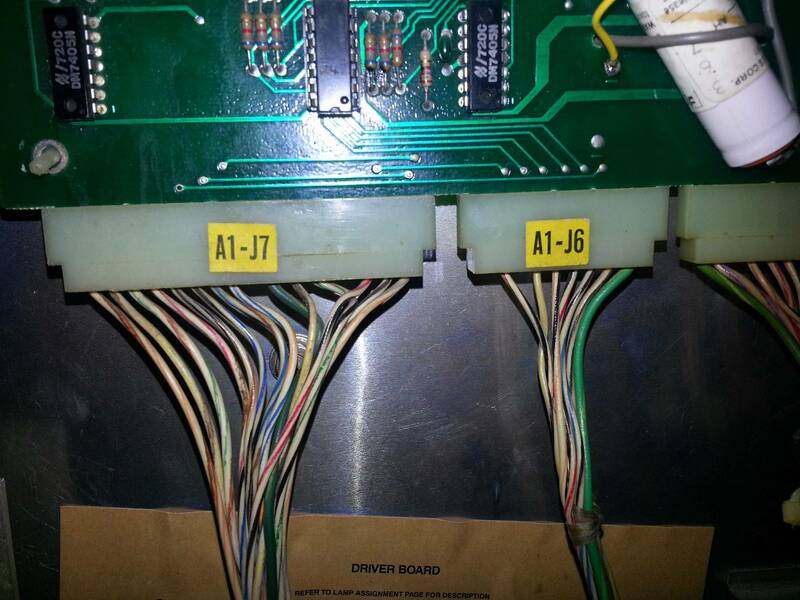 Here's a couple of pics of A1-J6 & J7 that I rewired, Can anyone confirm if this is correct? I just checked the schematic for Countdown and the colours are different to those I posted from JP (why they changed I don't know!). Do you have the schematic - pretty easy to figure out the colours. As far as wire colors being different. I have seen this several times on machines and my guess would be while building machines they ran out of certain wire color wire so that just used something different they had in stock. When you stop and think about it with a half of a mile of wire in every machine and all the different colors it is kind of surprising it didn't happen more. One that I always think is funny is the harnesses on early SS machines that have 95% plastic wire and a couple cloth wires mixed in. You know they did that just to use up old wire! Can you imagion how many rolls of wire a company had to have in stock to build harnesses for several thousand machines each year! Thanks for the help so far guys. I don't have a manual or schematic for the game, No digital copy freely avail either of course. Just been using Clay's system 1 repair guide. Checking my wiring against OTTOgd's I have A1-J6 correct, A1-J7 pins 1-4 correct but was incorrect on pins 5 thru 17 with each of those wires being in the wrong spot one away from where it should be. Currently I can't get the gameplay to actually start so hopefully once I rewire A1-J7 I'll be able to finally start a game! Will check back with an update & thanks again for the help. I have a CountDown and have repaired and sold 3 others. Gottlieb was notorious for using different colored wire than from what the manual states. I have seen this in my CountDowns, Cleos, Sinbads and Joker Pokers. When you get the wiring straightened out hopefully CD will work. If it doesn't , more than happy to help. Well I rewired A1-J7 as per OTTOgd's picture above (All wire colors match). I turned the machine on & after the standard 5 sec bootup delay all 4x displays show all zeros (Solid) while the small credit display shows nothing, Pressing the start button does nothing as before. Turned machine off then back on, Normal 5 sec delay then all 5x displays including the credit display show all zeros but now they are rapidly cycling on/off each segment. Pressing start does nothing (Machine is wired to freeplay). I need to upload both videos so you guys can see & will try to do so shortly. Ok I have finally uploaded both boot up videos of my Count Down. When I boot my Count Down machine I get either of the two results. Any ideas as to what the issue here is? Are the slam switches adjusted correctly? I'm assuming your using all Stock system 1 PCBs and power supply? Yes all stock system 1 boards, Nothing by pascal or niwumph. Replaced all caps on power supply board, Replaced all transistors on driver board & completed upgraded ground mod to that board. CPU board had corrosion damage from leaked battery. Repaired corrosion damage, Completed remote battery pack mod, Slam tilt bypass mod, New CPU to driver board wiring harness, Replaced all of the ICs along the bottom of the CPU board & the ground mod to each board also. For me.. first video is (probably) regular boot up, if you have "click-click" on a playfield G.I. (&relay) possibility is better. Question...after boot-up (first one is there any "high score to date" numbers on displays ? Starting a game... are you 100% shure in additionally wiring ? After doing slam tilt bypass jumper wire it turned into what's seen in the videos above. No switches work, The start button, The white diagnostics button inside the coin door, Nothing. I've traced the wiring out & all is good. No high score to date on the displays, I've only seen the number zero. Also want to add that this is my first & only gottlieb system 1 game & I have no access to any other so I can't test these boards in another working system 1 machine. Did you checked diodes on bottom of cabinet ? (did you have "click-click" (relay) on boot-on, and playfield G.I. off-on? And, what's about soldering skills, for removing some integrated circuits ? Could you post some pics of the front and back of PCB showing the replaced IC's and connector pads? Diodes have been checked. Relay clicks. I have a logic probe and I double check the pins on J6 when I was shorting pin 3 to pins 4-8 with no results. Thanks for the tips. I might get more aggressive on the repair attempts once I get the ni-wumpf in and see how I like the game. SadSack to avoid any confusion please don't hijack my thread, I believe cro_pinman is referring to the situation with my machine which has it's own unique problems. Soldering skills aren't a problem, I use a Hakko 808 to desolder ICs. I have J6 wired correctly I believe. Here's a pic of my CPU board. I replaced a number of IC's on the board (Shown in pic with green dots) a couple of weeks ago (Before starting this post). 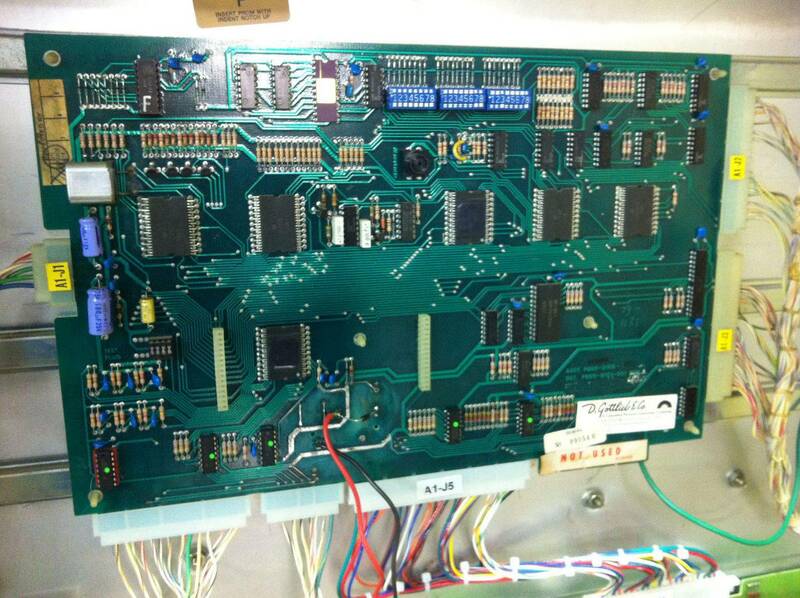 Please post a closeup of the lower left corner where the chips were replaced. Gave up on the original CPU board & ordered a replacement from Pascal Janin. Still sure there will be other problems such as 2x of the drop target banks not working. Recieved the Pascal CPU board last week & (Just about) everything works! Should have purchased one of them from the start, Oh well. The problem I have is that the 2x left side flippers don't work. Would this be a problem with the cabinet flipper button switch? The wiring all looks good, Still yet to check the coil diodes etc. Buy new flipper switches. Yours are probably gone or heavily pitted, not making proper contact. Game will play alot better if new flipper switches installed. Should then be good for quite a few years of home use. Ps. Pascal boards are the best! I thought my countdown just had connector problems, but when I went through the interconnect, the system 1 MPU still didn't go into setup. In the end, it took a ni-wumpf to fix it. In the future, I will assume that any system 1 with an original MPU will need a replacement either immediately or shortly in the future. To close this thread the game is now working 100%, Flipper issue was due to a plug inside the cab. 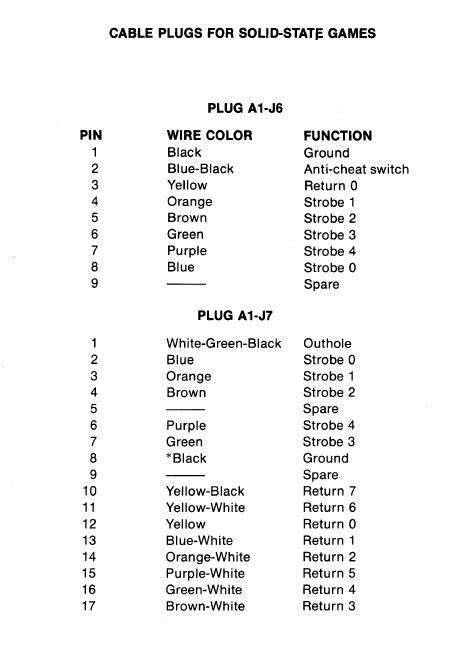 Just a note on the differences in wire colors. Gottlieb didn't run out of wire. They used single color wire, the cream colored wire you see most of the time, and had a machine with Sharpie like pens that put the traces on there. Lots of times, there will be a wire color on the schematic, then something like this (300) after it indicating a wire change. If you check those numbers against the chart on the schematic, you'll see that those numbers most of the time correspond to the correct wire color. I tell you what. I'm currently working on 3 Joker Pokers at once. I got the first one up and running, then I was re-pinning the second PF. 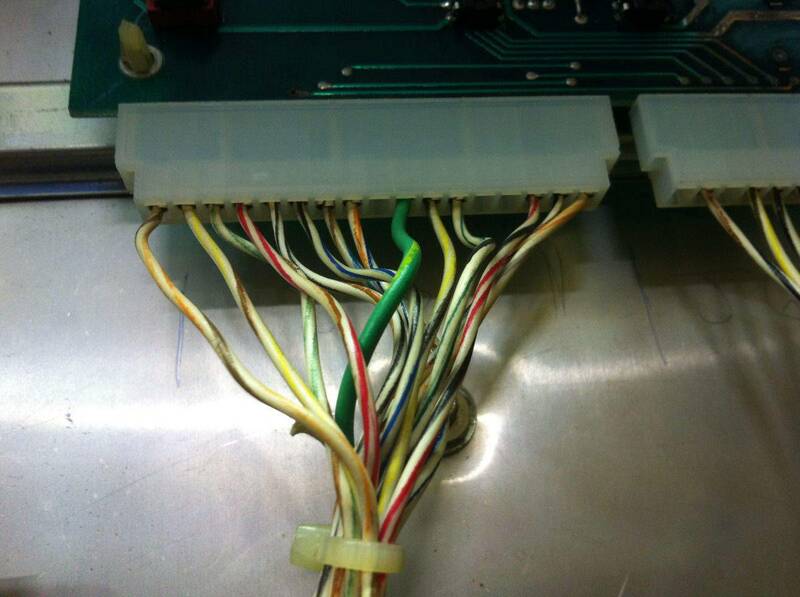 Some prior idiot had soldered the wires to the driver board. To put the wires back in the connector, I referenced BOTH the other PF and the manual. When I was done, I had one wire that didn't match. After doing a little sloothing with my DMM, I determined that this was the wire for all the standup switches. Green in two out of three of my PFs. Green in the manual. White with some stripes on this PF.